Are you really prepared for the upcoming school year? You’ve likely combed through the bag of weekly circulars for the best value on back-to-school necessities. However, have you considered investing in memory, concentration, and immunity for academic excellence, personal success, and happiness for your child this semester? New Roots Herbal has a great selection of supplements that will help your children reach their full potential. The difficulty of bidding farewell to summer and heading back to the structured routine of school cannot be underestimated. New Roots Herbal’s Children’sMulti will ensure your child has great health and energy to spare for homework, sports, and after-school activities. Children’sMulti is formulated by leading naturopaths with a comprehensive list of nutrients for the growth and development of children from infancy to adolescence. Each scoop contains 250 mg of vitamin C, 100 mg of calcium citrate, 50 mg of magnesium bisglycinate, 10 mcg (400 IU) of vitamin D and 30 mg (45 IU) of vitamin E (mixed tocopherols). New Roots Herbal’s Children’sMulti also contains zinc citrate and copper citrate, which support the immune system by helping the body to produce white blood cells that defend against viruses and bacteria. [1, 2] Vitamins C and D3 promote collagen formation; the production of collagen is critical for healthy joints, bones, blood vessels, and skin. Children’sMulti delivers active forms of B vitamins including vitamin B2 (riboflavin-5'-phosphate), B6 (pyridoxal-5'-phosphate), B9 (from calcium l‑5‑methyltetrahydrofolate), and the active form of vitamin B12 (methylcobalamin). B vitamins allow for better absorption of macronutrients such as proteins, lipids, and carbohydrates. In addition, the formula contains iodine, which regulates the metabolism and helps develop nervous and skeletal systems. Other nutrients include biotin to maximize the absorption of nutrients, iron for oxygen transport and immune support, and choline to support fat metabolism and produces the important neurotransmitter acetylcholine. In a convenient powder form with natural berry and lemon flavours, our stevia-sweetened formula tastes great with water, but can also be added to plain yogurt. Furthermore, stevia will not spike blood sugar levels or damage tooth enamel. Omega‑3 fatty acids are critical for the development of a strong immune system and for healthy brain function necessary for focus, concentration, and learning. However, the challenge of eating enough omega‑3–rich species of fish and other food sources to quench childhood and adolescent demands is difficult, to say the least. Adding an omega‑3 fatty acid supplement to your children’s routine will ensure they get the nutrients they need to flourish. New Roots Herbal Children’sOmega‑3 contains a 2:1 ratio of EPA to DHA: 100 mg of EPA (eicosapentaenoic acid) and 50 mg of DHA (docosahexaenoic acid) per capsule. This is the clinically proven ratio of the fatty acids a developing body and mind crave. EPA has been the subject of many research studies determining its effectiveness to counter inflammation, including asthma. [5–7] It also helps maintain cognitive, immune, and cardiovascular health. DHA has also been proven to benefit cognitive function. Its ancient name is “cervonic acid,” which refers to the brain and the benefits it can bring to nerve function. A third of our brain’s lipids are made up of DHA, and it is also present in high concentrations in our retina. 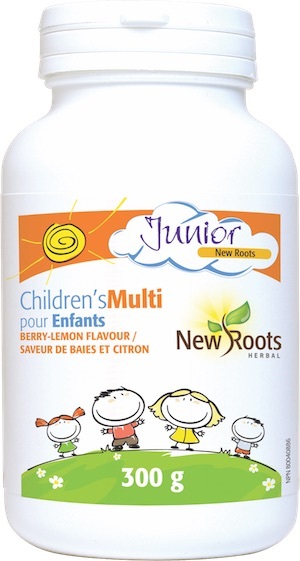 We recommend four chewable softgels of New Roots Herbal’s Children’sOmega‑3 daily. Research proves that concentrated dosages of EPA can reduce cognitive problems related to attention deficit hyperactivity disorder (ADHD). Omega‑3s can also work to stabilize the mood of your child. Omega‑3 supplementation can help with seasonal allergy symptoms and for children that suffer from inflammatory skin conditions such as hives and eczema,[9, 10] as well as psoriasis. Our Children’sOmega‑3 are sweetened with stevia and have a natural lemon flavour that tastes great. They’re easy to swallow, and even popular with adults who experience difficulty with larger capsules. New Roots Herbal’s Children’sProbiotic is formulated with 12 distinct probiotic species. It delivers the ideal balance of Lactobacillus and Bifidobacterium strains at a potency of 10 billion CFU per two scoop (daily dosage). Probiotics multitask as they travel throughout the digestive tracts of children. They participate in enzyme activity critical for helping the breakdown and assimilation of proteins, fats, and carbohydrates. They modulate (balance) immune response to protect children from inflammation that can contribute to asthma and dermatitis (urticaria, eczema, psoriasis). Daily protection from infections such as colds and flu are also among its many benefits. Our ultraconcentrated powder also includes a tandem of prebiotics: inulin and arabinogalactan. These prebiotics fuel colony formation of both our formula and the resident probiotics within children’s intestines. Children’sProbiotic is most effective when taken with food such as yogurt, fruit purée, smoothies, fresh juice, or pudding. Children’sProbiotic strengthens immune health, helping to avoid chronic infections and especially ensure that your child misses school less often. Better yet: you’ll use less sick days staying at home with your child, and free up time to enjoy life! Vitamin D is the sunshine vitamin for childhood mood and immunity! New Roots Herbal’s Children’sVitamin D3 provides 400 IU (10 mcg) per drop. Vitamin D3 (cholecalciferol) is the biologically active form of this critical vitamin produced through exposure of the skin to sunlight. D3 is essential for the absorption and utilization of calcium and phosphorus, as well as for the development of bones, teeth, and nails. A deficiency of the sunshine vitamin can also negatively affect mood and immune-system development. Therefore, adequate levels of D3 are crucial throughout childhood and adolescence. This is especially true for North Americans, whose vitamin D levels are among the lowest worldwide. The excessive use of sunscreen products is one of the factors that can negatively affect the body’s natural ability to manufacture vitamin D3. Clinical trials have shown promising results with vitamin D3 supplementation for children in regards to conditions ranging from irritable bowel syndrome (IBS) to respiratory infections including pneumonia. In addition, research conducted at the University of California at San Francisco has explored the use of liquid vitamin D3 for the core symptoms of autism. A correlation was also found between low levels of this vitamin and poor production of serotonin, which has been linked to symptoms of autism. At 400 IU per drop, the dosage can be easily adapted to suit individual needs. The dosage is simple and convenient, and its neutral taste allows you to take it on its own or with cold drinks, cereal, fruit, or even yogurt. McKinney, N. Naturally There’s Always Hope. Vancouver: Liaison Press, 2008, 426 p. (here p. 168). Balch, P.A., and J.F. Balch. Prescription for Nutritional Healing (2000): 298. Pfeiffer, C.C., and P. Gonthier. Équilibre psychobiologique et oligo-aliments. Paris: Éditions Debard, 1997, 515 p.
Aryayev, M. and N. Kononenko. “[Prevention of antibiotic-associated diarrhoea in patients with cystic fibrosis. ]” (Article in Ukrainian) Odes’kiy Medichniy Zhurnal Vol. 4, No. 114 (2009): 78. Mickleborough, T.D., et al. “Protective effect of fish oil supplementation on exercise-induced bronchoconstriction in asthma.” Chest Vol. 129, No. 1 (2006): 39–49. Nagakura, T. “Dietary supplementation with fish oil rich in omega‑3 polyunsaturated fatty acids in children with bronchial asthma.” The European Respiratory Journal Vol. 16, No. 5 (2000): 861–865. Surette, M.E., D. Stull, and J. Lindemann. “The impact of a medical food containing gammalinolenic and eicosapentaenoic acids on asthma management and the quality of life of adult asthma patients.” Current Medical Research and Opinion Vol. 24, No. 2 (2008): 559–567. Bloch, M.H. and A. Qawasmi. “Omega‑3 fatty acid supplementation for the treatment of children with attention-deficit/hyperactivity disorder symptomatology: Systematic review and meta-analysis.” Journal of the American Academy of Child and Adolescent Psychiatry Vol. 50, No. 10 (2011): 991–1000. Bjørneboe, A., et al. “Effect of n‑3 fatty acid supplement to patients with atopic dermatitis.” Journal of Internal Medicine. Supplement Vol. 731 (1989): 233–236. Koch, C., et al. “Docosahexaenoic acid (DHA) supplementation in atopic eczema: a randomized, double-blind, controlled trial.” The British Journal of Dermatology Vol. 158, No. 4 (2008): 786–792.